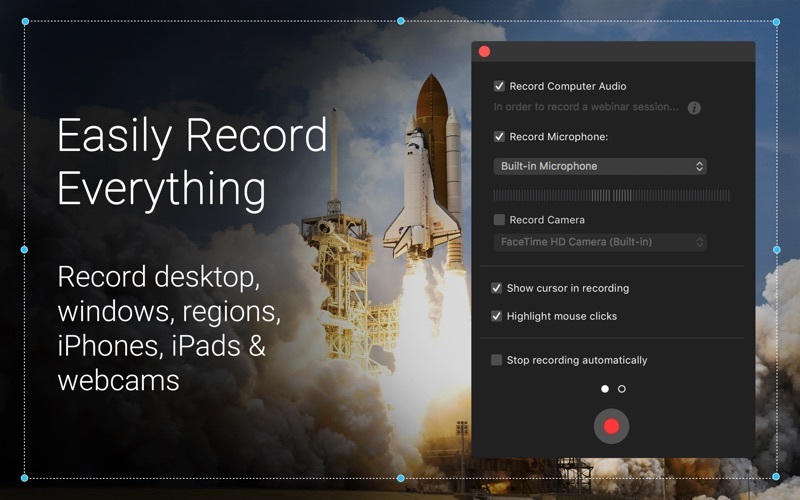 Capto is a new screen capture, screen recording and editing app suite that’s perfect for creating informative and compelling captures. Instantly record a video of your screen or take a screenshot, edit it and share at the press of a button. The app has a broad range of image and video editing tools as well as an easily navigable folder-based organizer for your screen captures. You can also setup instant sharing to all popular platforms like YouTube, Dropbox, Tumblr, FTP/SFTP servers and more by signing into them just once inside Capto. Your imagination combined with rich onscreen content can be effectively used for designing Professional Tutorials, Vlogs, Educational Lessons, Design Concepts and more. You have the choice of taking fullscreen image captures or select portions with Capto’s flexible screenshot options. For saving a webpage with one click, use your own supported browser or use Capto’s easy-to-use browser. Record your entire screen or select portions in full HD at 60 FPS along with clear audio. Capto also has a video capture feature for your iOS device. You may also set up a timed recording that records for a predetermined amount of time. Make your tutorial videos more interactive. Record your own video while the screen recording continues in parallel. Get to choose from either the system camera or an external recording device for desired input. Resize the video as per your need and re-position it across the screen to make the tutorial more effective. 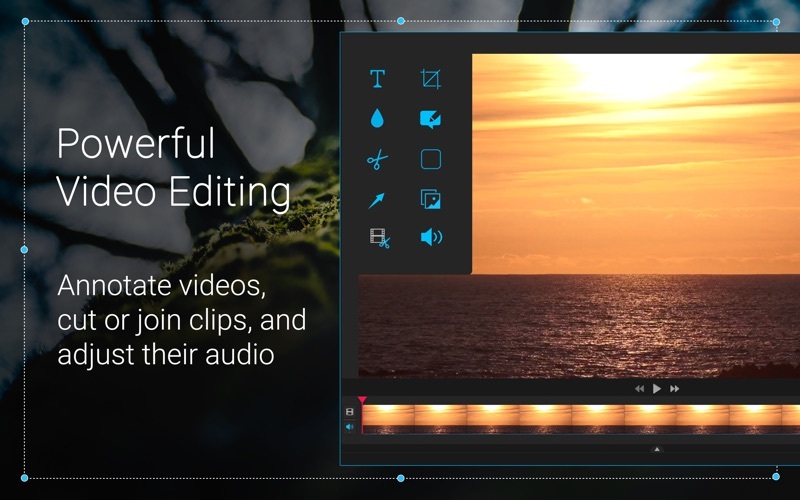 Capto’s powerful video editing suite gives you all the tools necessary to Cut, Join, Trim or Crop videos. In addition, you can add annotations to make your captured videos much more professional and detailed. Record crystal clear audio from either the system or the microphone and get better control over the output. Use the individual track control to adjust the inputs from the system and the mic separately and bring the best out of the audio. 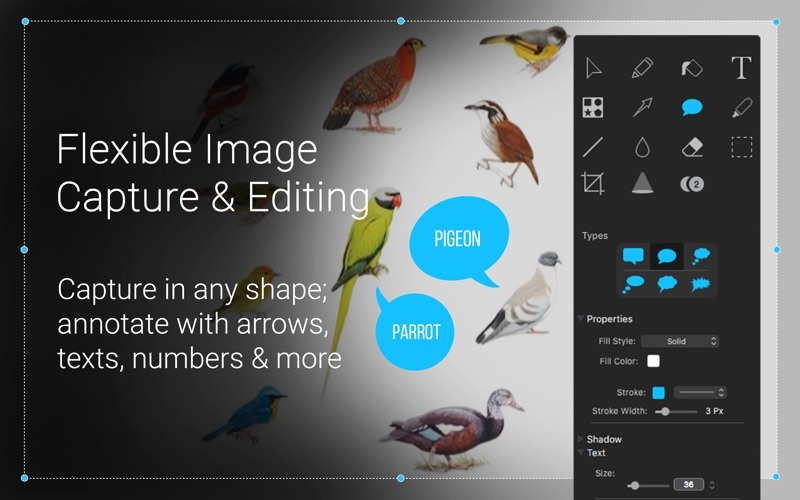 Capto has a fully featured image editor to enhance and create informative images. Highlight, Annotate, correct, or adjust the properties of your captured screenshot and make them stand out. Capto comes with an easy file manager for easy storage and retrieval of screen captures and recordings. 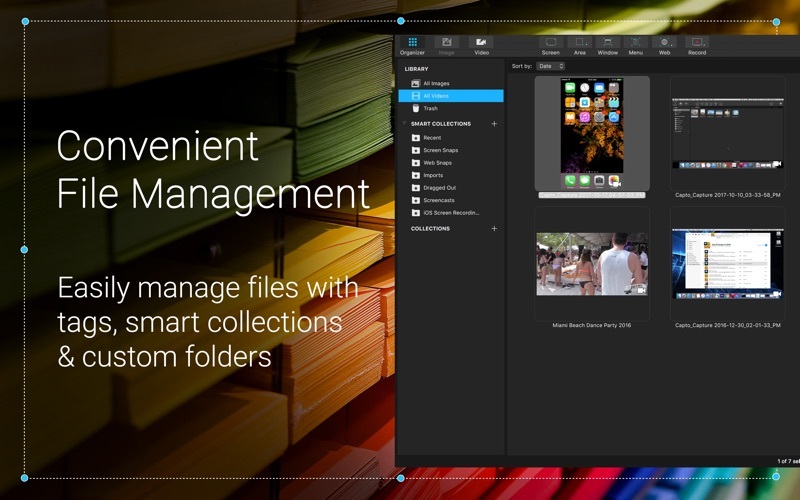 Every screenshot and video you take is sorted into smartly labeled folders that can also be customized. Instantly share or upload screenshots and screen recordings to your favorite services like Facebook, Tumblr, Dropbox, Evernote, YouTube and more directly with a single click. Capto also supports FTP/SFTP server uploads. Please follow Capto on social media for news, updates and tips. You can email us at capto@globaldelight.com with your queries or suggestions and we will be glad to assist you. If you like Capto, please keep your support coming in by leaving a positive review and rating on the Mac App Store. We appreciate it!